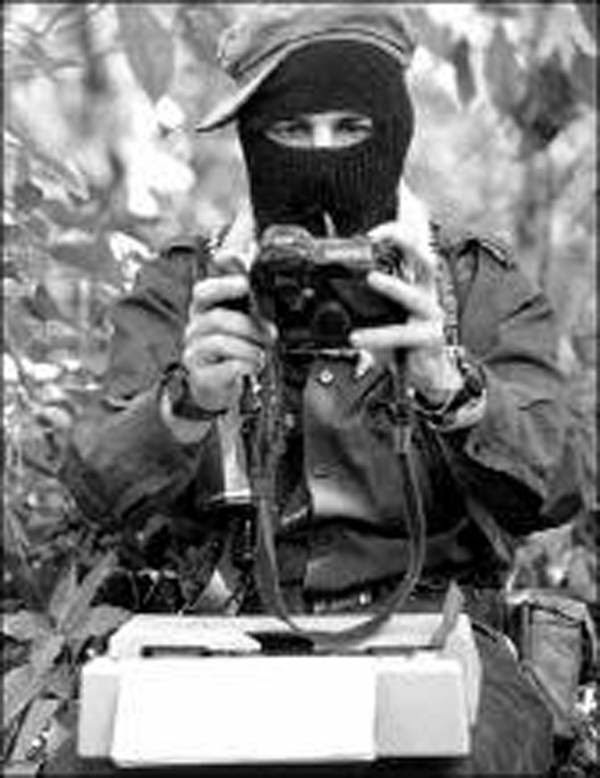 In the last three years, aggression towards EZLN (Zapatista) sympathisers in Mexico has intensified. As a result, displacement has increased, with many finding refuge in Acteal. Agustín Cruz Gómez in front of the church he is building in Ejido Puebla. EJIDO* PUEBLA, Chiapas – At 2pm on 20th July 2013, the Ejido Puebla’s PRI commissioner Agustín Cruz Gómez released a warning to the community in the Tsotsil language via loudspeaker: “Someone has poisoned the communal water tank”. The community, deep in the Chenalhó municipality, was also warned that the lives of a hundred people were at risk. Four hours later, Cruz (also a Presbyterian minister) claimed that the only two Zapatista militants in the community – Mariano Mendéz and his son Luciano – were to blame. He also led the mob that went to their house, beat them, tied them to a post in the basketball court, and threatened to set them on fire. Cruz doesn’t exactly have common interests with the Zapatistas. The Fray Bartolomé de la Casas Centre for Human Rights (Frayba) points out that he blessed the weapons used to perpetrate the Acteal Massacre of 1997. The mob also arrived at the house of the Baptist Juan López Méndez – a Zapatista sympathiser. His wife, five months pregnant at the time, tried to stop them from entering, but they pushed her aside and tipped over the furniture. In the commotion, a table fell on their one-and-a-half-year-old daughter. López himself, 26 years of age, was dragged out of the house. The mob told his wife that they were attacking him because he had poisoned the community’s water. López, subsequently also tied to a post, heard people in the crowd saying “bring petrol” and “let’s burn him”. The three accused were eventually sent to the official authorities, accused of possessing illegal firearms, drug dealing, and gang membership. Although they never received payment for the damage done to their property, they were soon set free due to the lack of evidence regarding each claim made. 99 people, from 17 families, have taken refuge in Acteal. These accusations represent just one part of a series of violent events that led to the forced displacement of 17 families (18 men, 19 women, and 62 children) from the Puebla Ejido. These families were given refuge by the civil society group Las Abejas (a pacifist group linked to the Zapatistas) in Acteal. The majority of the exiles now belong to this group. 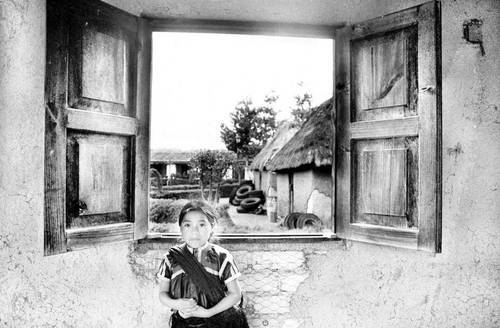 The Zapatistas have frequently denounced the intensified harassment and dispossession suffered in 20 communities in five of its Caracoles – autonomous Zapatista regions. In the Ejido, meanwhile, Cruz denies the acts of violence, sustaining that the 99 people are “self-displaced’, having “left voluntarily” and not because anyone forced them out. “They say I’m a paramilitary [but] I don’t [even] know what that means”, he asserts. Víctor Hugo López, director of the Frayba Centre, says this was not an isolated case, but simply one more in an aggressive campaign of threats, kidnappings and dispossessions against Zapatistas and their sympathisers. He affirms that these actions “have displaced 200 people in the last three years from communities like San Marcos Avilés, Comandante Abel, and Banavil”. In the dark, wooden room used as a kitchen by the displaced families in Acteal, a pan boiling beans sits on top of glowing pieces of coal. Virginia López Sántiz watches over the group’s only meal with a sorrowful expression: looking downwards with her body reflecting a feeling of defeat. Virginia arrived in Acteal on August 26th 2013, with six children between one and sixteen years of age. Her husband, Nicolás Arias Cruz, is the representative of the seventeen exiled families who, exiled from their homes, spend cold nights sleeping on sacks, sharing the few blankets they possess. 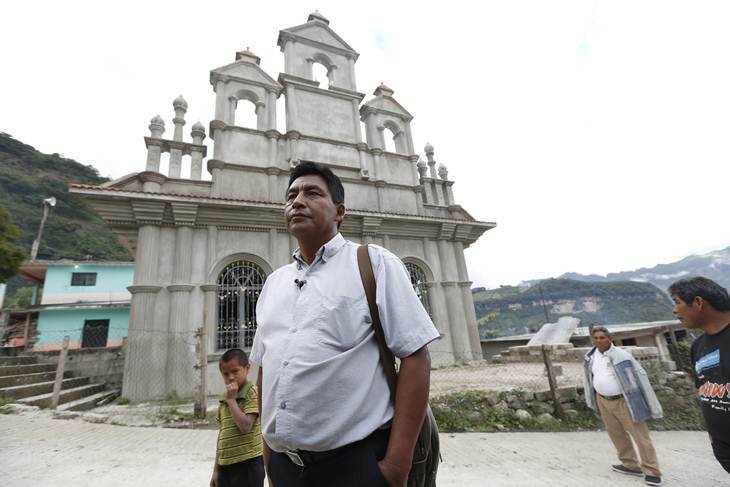 The family fled after a series of events which began when Agustín Cruz ordered the destruction on April 19th 2013 of a chapel being built by a group of Catholics. Nicolás was one of the members of the group, and he also belonged to Las Abejas. He was one of the people who reported the actions of the politician. Cruz, meanwhile, claimed they hadn’t asked for permission to demolish the old chapel and that, because it was on Ejido land, he reserved the right to destroy the one they were building in its place, later fencing off the land. After July’s accusations, the accused, along with four others who acted as witnesses in the lawsuit against Cruz, could not return to the town. Although the state government had established a ‘round table’ (mediated by the federal government and the media) to encourage reconciliation, the seven exiles saw their vehicles attacked with stones by youngsters when they were returning. As a result, they felt they had to pull back. Nicolás explains how “they burned two houses; a dog; our pozol (fermented corn dough) and beans; our firewood; and five crosses we had in storage”. A day later, the parish priest of Chenalhó, Manuel Pérez Gómez, went to the Ejido Puebla along with the state authorities to verify the integrity of the Catholic group. A crowd detained him, beat him, tied him up, and threatened to douse him in petrol. Only after five hours in captivity did they release him. This was the moment when it became clear that the inhabitants would have to leave their homes behind permanently and head into exile in Acteal. The lawyer from Frayba, Irma Vázquez, says that the conflict does not have religious roots. She explains that ten days before the conflict broke out on April 29, the Supreme Court of Justice of the Nation (SCJN) ordered the release of Jacinto Arias Cruz, former municipal president of Chenalhó, who has been accused of being the main instigator of the Acteal massacre, in which 19 women, 18 infants, four unborn and eight men, who all belonged to the organization Las Abejas, were executed. All were Zapatista supporters. “This is a call to violence, the youth are angry and their blood boils, and their young people are educated in violence, with a military training and structure, they are militants (milicianos),” says the lawyer. Vázquez confirms that the displaced families have filed three criminal complaints against those responsible for the destruction of the new chapel, for the assaults and death threats, and for kidnapping the priest, and demanding that they publicly determine who was responsible for the deception about the water poisoning. This afternoon, the newspaper El Universal travelled along the rough dirt track to this small community surrounded by wooded mountains. Cruz showed them the pile of rocks left behind after the demolition of the 38-year-old Catholic chapel. He then revealed the remnants of the reconstruction effort that the politician had allegedly stopped in its tracks. When asked who had destroyed the building before its construction could advance, Cruz replied that “some kids” had done it, trying to deny any responsibility for the act. When the commissioner showed the paper around the town as part of his first official interview with the media, youngsters looked down at them from their roofs, while the municipal police (who had arrived in the town after August’s unrest) stayed inside their outposts. Cruz made it clear that, in his town of around three thousand inhabitants, there are people from ten religious denominations, including Catholics, Baptists, and Pentecostals. However, his own church is clearly the brightest and most colourful – even though it is still under construction. With his church in the background, the minister denied the aggressions and death threats suffered by the displaced families, saying “there are no threats – nothing – they left voluntarily”. When asked if they could return, he said “sure, let them return. This is their Ejido. They were born here. Why do they want to suffer far away from here? We want a peaceful solution. Why would we want so much trouble?” At the same time, however, he rejects the exiles’ demands of punishment for those responsible for the crimes committed against them. “Right now, we’re not asking for justice. It is better that there is peace. And if they want peace, they’ll need to calm down too!” The tour then moved on, towards the basketball court where the three people accused of poisoning the water supply had almost been burned alive. Víctor Hugo López, meanwhile, considers the forced displacement of the exiled families to be part of the State’s counterinsurgency plan against the Zapatistas – a campaign aimed at “fighting against the civil society bases so that any EZLN expansion or territorial control is prevented”. He also points out that there is a recurring pattern of “harassment; displacement; arbitrary deprivation of life or freedom; and kidnappings – all of which are executed by members of the community who are affiliated to a political party”. He also says that these communities are suffering a gradual or total dispossession of their land and crops, alleging that the government gives ‘support’ to “whoever is prepared to fight against civil and Zapatista resistance”. In the case of Ejido Puebla, the “return of the PRI”, in his opinion, “means the return of the perpetrators”. In this Holy Land we welcome you and wish you a happy new year, despite the horrifying situation that reigns in our suffering and bleeding Mexico. Our hearts are very sad and outraged by the war that currently exists in the state of Michoacán. It is not a surprise that the government does not act upon the violence, but to the contrary, many of the civil and military authorities are colluding with organized crime, as reported by inhabitants from Apatzingán, Michoacán. This situation is a disgrace to Mexico. We know that guns do not bring life, but remove it, however, the people of the place in question have chosen to create self-defence groups, because that’s the only option that the bad government and its army leaves them, by not applying justice and protecting the citizens from the clutches of drug criminals. For example we read in several newspapers in the country that the military, instead of arresting members of the criminal group known as “the Knights Templar”, killed 4 civilians including a four year old girl in Apatzingán, Michoacán. During the government of Felipe Calderón there were more than 60,000 dead, without counting those disappeared due to the drug war. Now Enríque Peña Nieto is very clear that he wants to continue this policy of war that Calderon created, careless of the lives of innocent people. What kind of human beings are these so-called governments, who do not care about human life? But as these “leaders” are employees of the neoliberal countries, then they have no soul or conscience. It is very clear that neoliberalism is full of: demagogic speeches, welfare projects, land dispossession, violence, drugs, femicide, discrimination, oppression, imprisonment, mass murder, impunity, etc. According to neoliberalism, in order to prevent all these from happening, there has to be a Zedillo, a Calderón, a Peña Nieto, i.e. corrupt officials and politicians also involved with mafias. These governments are blatantly hypocritical; supposedly the U.S. government wants to help the situation in Michoacán, when in fact their country is the world’s largest consumer of drugs and supplier of guns to be use in wars that kill innocent people and countries. What the neoliberal governments actually say and do is disgusting. Brothers and sisters, our Mexico, our world is in complete crisis because of the greed of a few people for money and power, those who want to control everything at the expense of the work and the blood of the poor and innocent. All of us from las Abejas of Acteal, we confirm and uphold our word that we expect nothing from the bad governments, nor from the political parties. We are the ones who have to decide how we should govern and live in harmony amongst ourselves. Young perpetrators use verbal abuse towards the displaced when walking through the streets. Probable gun shots near a river in the ejido. How sad and outrageous it is that the authorities of the bad government are so accustomed to offering goodies and crumbs, rather than applying justice, in order to leave offences unpunished, regardless of whether it is a simple offence or a crime against humanity, like the massacre of Acteal. It is very clear that the bad government in its three levels, its heart and its head do not want peaceful justice and dignity in the ejido Puebla. It only wants our brothers and sisters to forget about the attacks, and instead calls to start a “new page”, which means exemption from punishment, as is the usual habit of the bad government. We hope that our displaced brothers and sisters can remain the 10 days, although as already mentioned, there are not conditions to remain in Puebla, because they realise that they are not respected by the attacking group. There are so many things that start in this year 2014, sadness that has started with blood and begins with the greatest impunity. Nevertheless, we have to strengthen our fight. Raise our voice to calm down the war in Michoacán. The violence in that state is a reflection of how Mexico is immersed in hell. We respectfully ask all men and women of good heart to be united and make protests, demonstrations, public complaints from our locations, against this reality that exists in Mexico, because it is urgent to stop this nightmare. Before finishing, we would like to say that on 24th January it will be 3 years since Jtotik Samuel is no longer physically with us, but his spiritual presence and the teachings that he shared remain here with us forever. His memory will always live in our hearts. We’ll never forget his struggle for peaceful justice and dignity for our people. Brothers and sisters, we wish you strength in your hearts, do not be discouraged, stand firm in your struggles, because the year is just beginning. Division of the peoples, even among families; offensive and consumerist promises; distribution of checks; conditionality of programmes; veiled threats and that’s not all. The federal envoys who promote the Fund for Support to Agrarian Nuclei without Registration (FANAR, a successor of Procede) even arrived to negotiate bearing alcoholic beverages, as happened at the end of 2013 in Joltulijá, a beautiful community with two lagoons, endangered by potential tourism. “They came to offer a bottle of alcoholic drink to the commissioners, which they rejected saying: ‘what you don’t see is that we are trying to stop the people from drinking and you come to offer us alcohol,’” relates an older man from this community. “The majority of us are in resistance, but behind our backs a few solicited land titles from the government, when what they are seeking is to dispossess us. The pressure is great, because of the interest in tourism. They arrive with public ministers and to frighten us they tell us that they are going to ask for the Army to make us accept.” In fact, a detachment from the Navy arrived, but withdrew faced with the rejection of the indigenous. The succession of testimonies have the force of repetition, confirmation of why the communities in the northern Lacandón Jungle reject the land titling and regularisation procedures promoted by the government. Many of them are situated, at least partly, inside the so-called buffer zone of the Montes Azules Reserve. For many years, the governments have tried to limit their territorial rights, or take them away. It is appropriate to mention that there are also numerous Zapatista support bases within this zone, and that they per se reject any government interference, do not receive programmes and defend their territory. With profound sadness and indignation we have found out about the death of our compañero Francisco Kuykendall, el Kuy. His death is an absence in our lives and in our struggles. On January 25th, 2014 our compañero Francisco Kuykendall Leal died. His death is the consequence of the impunity with which the police behave. On December First, 2012, exercising his right to assemble, and going along to perform a play in the vicinity of the Congress of the Union, a teargas grenade was fired by the Policía Federal Preventiva directly at Kuy’s head. Those responsible remain free, surely committing crimes against more social fighters. Since that December First the brutality of the local police, not only in Mexico City, and federal police was clear. That Enrique Peña Nieto, Andrés Manuel López Obrador, or Josefina Vásquez Mota had been in their ascension to power in this hurt and wounded Mexico has no connection, that politics already was planned by the strong pressure from great national and transnational capital. From there the tremendous and brutal repression of that December first, from there which since that day practically any public protest is heavily guarded, and more that a few times repressed, no longer by police, but by uniformed hordes; since that day the rise in selective detentions, with ridiculous accusations, are currently something common. We know the damages which that teargas grenade provoked. The resistance of our compañero was sustained for more than one year, aches, fevers, infections, seizures, it is true, but also smiles, handshakes, and lively looks were part of this last resistance process of our compañero. Today we are left with, yes, sadness, but before all else rage. All those responsible for his murder are unpunished: Enrique Peña Nieto, Manuel Mondragón y Kalb, the armed beast who fired at him, without forgetting that the still mayor of Mexico City Marcelo Ebrard, coordinated his hordes with the federal ones. This affront against social struggle, against the adherents to the Sixth Declaration of the Lacandon Jungle, must remain in our collective memory. This crime committed against a compañero who decided to arm himself against injustices with theatre and performance, and offer his solidarity with his art, we will not forget. From below and to the left we seek justice for the life of a compañero who was set on making this world something more just, free, and democratic. May Kuy be certain that each member of this Network will continue to construct with determination a non-capitalist world whose cements are the below and the left from where we are and who we are. ¡Hasta siempre compañero Kuy, hasta siempre! AI made the statement after learning that Kuykendall died from the consequences of a rubber bullet shot in the head received during the crackdown on demonstrators on December 1, 2012, outside the Chamber of Deputies in San Lazaro. Kuykendall, a native of Tamaulipas, a teacher, playwright and theatre director, “was in critical health since December 1, 2012,” the organization recalled, warning that although there are indications that the shots against the protesters, one of which struck Kuykendall, came from the federal police, “the authorities have not clarified the circumstances surrounding the serious head injury suffered” by the activist. The organization insisted that the authorities are obliged to report on the use of such weapons, the training received by police that use them, and use protocols. “Amnesty International also calls on the authorities to subject any use of force by security forces to international human rights standards,” the organization stated. Reiterating the urgent need for those responsible for injuring Kuykendall to pay for their deeds, Amnesty International called on authorities to be accountable for a commitment that “the police are properly trained” and that they adhere to international standards on the use of “less lethal” weapons. Minutes before Amnesty International disseminated its statement, Fernanda Kuykendall, daughter of the activist revealed that the Public Prosecutor has initiated an investigation into the murder of her father. “Finally, the MP (Public Ministry) determined that it was a homicide, and the authorities will have to clarify the facts (…) It’s on the death certificate,” Fernanda said to Radio Formula. In January 2013, the family of the activist and playwright filed a criminal complaint against the violence suffered by Juan Francisco Kuykendall at the hands of the Mexican government and in particular against Enrique Peña Nieto, Manuel Mondragón y Kalb, current commissioner for National Security, and Miguel Ángel Osorio Chong, Secretary of Government Relations [SEGOB]. The Human Rights Commission of the Federal District (CDHDF) lamented the death of Kuykendall, whom it described as a social activist, who participated in the 1968 student movement and had supported social causes since 1970, as well as being an actor who wrote and presented works of a social character to inform and raise awareness about social and political realities. ** They “try to put an end to our knowledge. They want to privatize our rivers, forests and waterfalls,” they say. Representatives from twenty Chol, Tzeltal and Zoque communities of the region, organized in the Committee for the Defence of Indigenous Freedom (CDLI), Tsoblej Yu’un jWocoltic, the Union of Communities of the Lacandón Jungle (Ucisech) and Xi’Nich (The Ants), met in Nuevo Jerusalén this weekend to document the pressures from the federal government through the conduct of delegates from the Secretary of Agrarian, Territorial and Urban Development (Sedatu) and the Agrarian Prosecutor, particularly in municipality of Ocosingo, to make the communities compromise ownership of their land in exchange for programmes; that is, money. Discontent runs through the communities of the northern Lacandón Jungle, because of the application of government programmes which limit their use of the land, in particular the Support Fund for Agrarian Nuclei without Registration (Fanar), which would allow the privatization of individual plots, and is promoted by the Ministry of Agrarian, Territorial and Urban Development (Sedatu) and the Agrarian Prosecutor. Even the large pro-government conglomerates of the so-called “Lacandón Community” (Nueva Palestina, Tzeltal, and Frontera Corozal, Chol) have shown their disagreement. They were particularly affected by the Redd Plus programme. It is no longer functioning, but it was found useful during the last government for making them sign a series of promises which in fact impeded them from making use of their lands, a first step towards dispossession. These communities, in particular Nueva Palestina, have a long history of violence and abuse against dozens of villages of different organizations, both inside the Montes Azules Reserve and in the “buffer zone;” the most serious, but not the only one, being the Viejo Velasco Suárez Massacre in 2006, which is still unpunished although two residents of the Nuevo Tila ejido are accused of the actions, and there are arrest warrants against them, despite the fact that they were compañeros of the victims. According to the zone’s independent organizations, those really responsible are residents of Nueva Palestina and members of the Lacandón town of Lacanjá Chansayab. And he continues: “Each time they want more power and resources they blackmail the state. They did it with Juan Sabines Guerrero, and he gave them handfuls of money supposedly to take care of the Lacandón Jungle. The Lacandóns handed over their lands through the Redd Plus programme for ‘environmental services,’ in exchange for 2 thousand pesos per month. The old community members signed the agreement without the consent of their children, and these now demand that they are also given money. “We don’t know what they want, supposedly justice, we doubt that it’s really that, rather it’s a strategy to get more money. How many millions did Pablo Salazar Mendiguchía not waste to buy the lands of the Lacandónes? How many millions did Sabines not take from the state to be given to the Lacandónes for ‘environmental services’? The Lacandónes are useful to the government; it uses them to justify mega-projects in the zone,” he maintains. On a La Jornada tour through the northern Jungle we found that this situation affects almost all the communities. What is new is that the unconditional (supporters) of the government have also discovered they are ensnared. 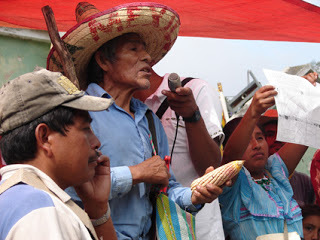 “The (residents) of Nueva Palestina and the Lacandónes have been identified by the Chol, Tzeltal and Zoque communities as paramilitaries for the governments, since the times of President Luis Echeverría and Governor Manuel Velasco Suárez,” states the indigenous man, a member of the Union of Communities of the Jungle of Chiapas (Ucisech, its Spanish acronym). Representatives of the displaced people from the ejido Puebla, in Chenalhó, who on Monday will complete 10 days harvesting the coffee fields which they left behind last August, announced that they will return to take refuge again in the Las Abejas camp in Acteal, where they have been staying for six months, because conditions for their definitive return still do not exist and the state government has not fulfilled the demands of the indigenous, Nicolás Cruz Pérez stated today. “During the time we have been harvesting the coffee we have received threats and attacks, we have a list of these acts, and are letting the Public Prosecutor (who the government sent from January 17 to 27) know about the threats and attacks,” which are the same ones Governor Manuel Velasco Coello was told about “on his visit to our ejido on January 22,” added the indigenous, insisting on a “just and dignified” return. The demands of the families, who were displaced by the violence of an officialist (pro-government) group from the community are: reparations for damages (robberies, damage to property and crops), restitution of the chapel annexed by the ejido authorities, and the application of the law to the numerous crimes committed by the officialist group. During the time that they have stayed in the ejido, the displaced have received continual insults and threats of the same kind that dispossessed them of the chapel. In another matter, it was reported that the Tzeltal campesino Antonio Estrada Estrada, from San Sebastián Bachajón (Chilón), received an amparo (legal protection order) which opens the door to his final acquittal. Released from prison last December 24th, until now his freedom has not been complete. The state government released Estrada, an adherent to the Sixth Declaration of the Lacandón Jungle, after he had been arrested illegally, tortured and unjustly deprived of his freedom for more than two years. When he left the prison at Playas de Catazajá the accusations of a federal crime, although unfounded, were still hanging over him. For this reason he still has to go periodically to sign in at a lower court in the state capital. The lawyer Ricardo Lagunes Gasca, legal representative of the ejidatarios, explained that his liberation was through a benefit of law granted by the Chiapas government. However, “Antonio has not legally regained his innocence,” plus he also faces a federal trial before the sixth district judge in Tuxtla Gutiérrez. This trial derives from the same matter for which he was sentenced to more that seven years; now the charge is added of carrying a firearm for the exclusive use of the Army. With this resolution the doors are open for the judge of the sixth district in Tuxtla Gutiérrez “to grant Antonio Estrada Estrada his complete freedom in the federal criminal case which is being heard in that court, and for him to finally recover his complete legal freedom,” the lawyer concluded. The ejidatarios [communal landholders] of San Sebastián Bachajón, adherents toThe SixthDeclaration of the Lacandón Jungle, have denounced that the officialist [pro-government] authorities are preparing a new fraudulent move to justify the handing over of part of the ejidal territory to the government for purposes of tourism, and in this way to consolidate a dispossession which has been underway since 2011. The ejidatarios demand from the government: “the immediate cancellation of the charges against our compañero, and also the release of Alejandro Díaz Santiz, member of solidarity with the Voice of El Amate, who is held in Cereso Number 5 in San Cristóbal de las Casas”. They warn that the people of San Sebastián Bachajón will continue resisting “the dispossession and persecution from the bad state and federal governments.” They greet the peoples and indigenous communities of Mexico and the world “who are also fighting for Mother Earth and don’t let themselves be overcome by the violence, discrimination and contempt from the bad government and its capitalist entrepreneurs, who seek to make us disappear so they can take over our land and its natural resources”. 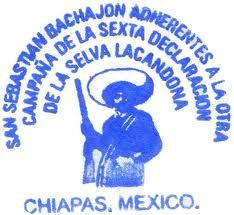 San Sebastian Bachajón continues to resist dispossession and persecution from the bad federal and state governments. Compañeros and compañeras, the people of San Sebastian Bachajón continue resisting in struggle against the dispossession and persecution from the bad federal and state governments. We greet all the peoples and indigenous communities of Chiapas, Mexico and the world who are also fighting for Mother Earth and do not let themselves be overcome by the violence, discrimination and contempt from the bad government and its capitalist entrepreneurs who seek to make us disappear so they can take over our land and natural resources for personal and financial gain. We denounce the deceptions and corruptions of Alejandro Moreno Gómez, the officialist commissioner of San Sebastián Bachajón, and the Chairman of the Vigilance Commission, Samuel Diaz Guzman, who are deceiving the ejidatarios and the people in general of the community of San Sebastián Bachajón with false promises to get a government coffee project; and they are asking for a copy of the certificate of land rights and of the IFE voting credential, supposedly in order to get that project, but it is a lie because we know clearly that once again they are going to fabricate assembly minutes with forged signatures of ejidatarios to ask the Seventh District Court in Tuxtla Gutierrez to cancel our amparo 274/2011; this is the real intention of Alejandro Moreno Gómez, advised by the bad state and federal government; behind the backs of the general assembly of ejidatarios, which is the highest body, they are aiming to remove any obstacles to keeping our lands, violating the very laws of the bad government and violating our rights as a people recognized in the constitution and international treaties. We also denounce that the bad government of Manuel Velasco Coello has not completely freed our compañero Antonio Estrada Estrada, because they only let him out of prison, but they still legally hold him guilty of the assault of which two specialized police from Palenque, Chiapas, accused him. He must attend to sign every week at the Sixth District Court in Tuxtla Gutierrez, Chiapas, because they also fabricated the crime of possession of a federal weapon against him when the compañero was tortured; he is innocent and does not have any economic resources. 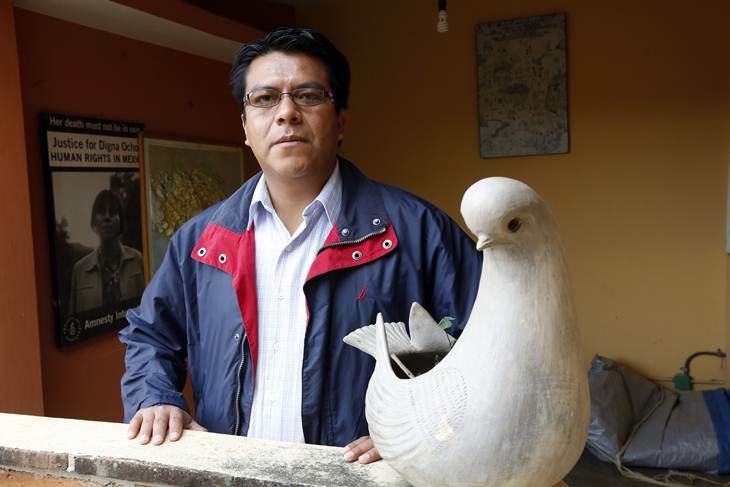 On 24th December, 2013, when our compañero was freed, the Undersecretary of Government, Carlos Morelos Rodríguez, went to the prison at Catazajá to make our compañero Antonio sign a document, telling him that the Bureau of Reconciliation of the Government of Chiapas needed [his signature] to give him his freedom that same day, and that he would not be released if he did not sign it; so the compañero signed it. Afterwards the Government of Chiapas delivered that document to the Third Collegiate Court in Tuxtla Gutierrez so that it would cancel amparo 915/2013, which was in place against the 7-year sentence for assault and organized crime. We demand from the bad government the immediate cancellation of the charges against our compañero Antonio Estrada Estrada, and also the liberation of our compañero Alejandro Díaz Santiz, of solidarity with the voice of el amate, held at cereso number 5 in San Cristobal de las Casas, Chiapas. We demand respect for our people and organization, we will not allow the humiliations from the bad government and from those who want to continue to dispossess us and discriminate against us just for being poor and indigenous; we will continue to fight for what is ours, even though the government does not like it. We ask all the compañeros and compañeras and national and international solidarity organisations to remain alert as to what is happening in our community. 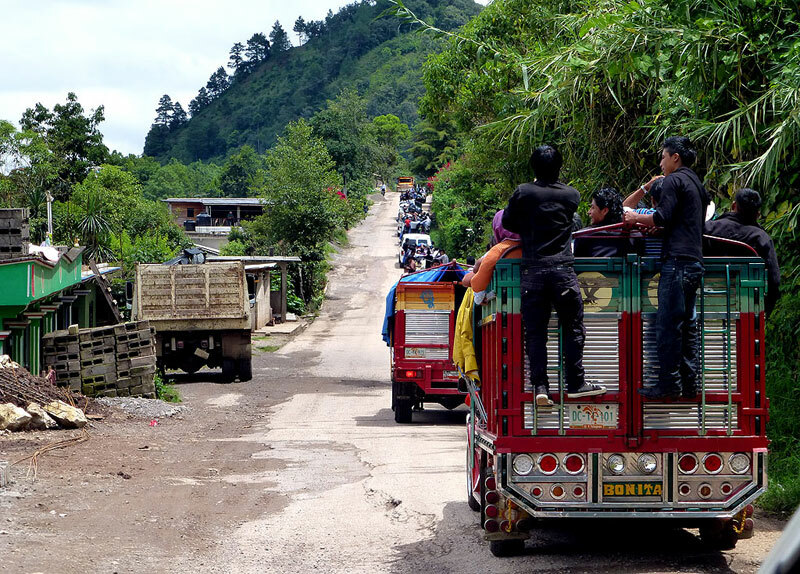 From the northern zone of Chiapas, receive a hug from the women and men of San Sebastián Bachajón. Line to search delegates, Zapatista Encuentro, 1996. It’s raining gently in the open field. The mist clings to shawls and skirts andpasamontañas,the face-covering ski masks that have become iconic imagery for the Zapatistas. “We cover our faces so that you can see us” is a famous Zapatista saying. And it’s true: For a group of people often erased by politicians and exploited by global economies, the ski-masks have the curious effect of making previously invisible faces visible. Laura Gottesdiener is a journalist, social justice activist. She is an associate editor for Waging Nonviolence, and she has written for Rolling Stone, Ms. magazine, The Arizona Republic, TomDispatch, and other publications. She lived and worked in the People’s Kitchen during the occupation of Zuccotti Park. 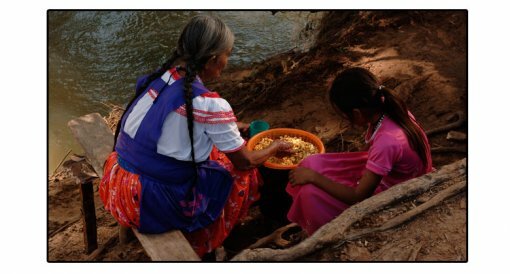 From Fire to Autonomy: Zapatistas, 20 Years of Walking Slowly By Andalusia Knoll and Itandehui Reyes, Truthout Copyright, Truthout. May not be reprinted without permission. “He was very malnourished, with deep scars and since he used tubes to urinate and to eat, infections began to attack him. Just yesterday when I went to see him I could tell he was having a lot of difficulty breathing,” said Palma in an interview. She said that since Kuykendall’s injury, suffered during the protests against the inauguration of Enrique Peña Nieto, the activist was treated at several IMSS clinics, including at the XXI Century National Medical Centre, where he was discharged for supposedly being in “stable” condition. “The thought that sticks with me is that men as productive and concerned with culture as Kuy, who was an activist since the ‘70s, don’t deserve to end up like him, because of the state, because of men like Peña Nieto, Osorio Chong or Manuel Mondragón, who were the ones who ordered the operation. “The capitalist system is very unjust and in the end, my partner fell in battle, but he leaves us his example, his legacy and we are going to claim him as an adherent to the Sixth Declaration of the Lacandon Jungle. He fell in battle for his ideals,” Palma emphasized. After being hit in the head with a projectile – it is believed it was a rubber bullet – Juan Francisco Kuykendall suffered a cranial fracture causing him to lose part of his brain mass. It is expected that this Saturday afternoon a wake will be held for the activist at a funeral home in the Doctores neighborhood in Mexico City. The 67 year old, originally from Nuevo Laredo, Tamaulipas, migrated to the Federal District in 1967 with the goal of being an actor. He achieved that at the National Institute of Fine Arts, where he studied drama. His wife, Eva Leticia Palma Pastrana, remembers that 1968 was a year of political turmoil that “also impacted Kuy,” as he is known among friends and family. On October 2, he joined the students’ protest, but during the arrests he was saved by a Cuban doctor who hid him in her apartment. Many years later, after becoming a playwright, set designer, theatre teacher and supporter of organizations and collectives such as the Other Campaign, we wanted to go to the May 2006 protests in San Salvador Atenco, but we got lost. We were saved many times, says Palma Pastrana. The same did not occur on a Saturday, when Kuy, 67 years old and a resident of Coyoacán, went with his friend Teodulfo Torres to the protest around the Chamber of Deputies. On January 18, a group of friends and family of the teacher Juan Francisco Kuykendall filed a complaint with the Federal Attorney General’s Office (PGR) to demand clarification of what happened and punishment for those responsible for the attack. Joined by members of the student movement #YoSoy132, the Peoples’ Front in Defence of the Land, and other social organizations, Rodrigo and Fernanda Kuykendall, children of the academic, entered the premises of the PGR to file their lawsuit, which also requests full compensation for the injury. This Friday, January 24th, the fifth district court, seated in the city of Tuxtla Gutiérrez, conceded to the ejido Tila a provisional suspension of the public works planned by the municipal government, under amparo (protection order) 73/2014. 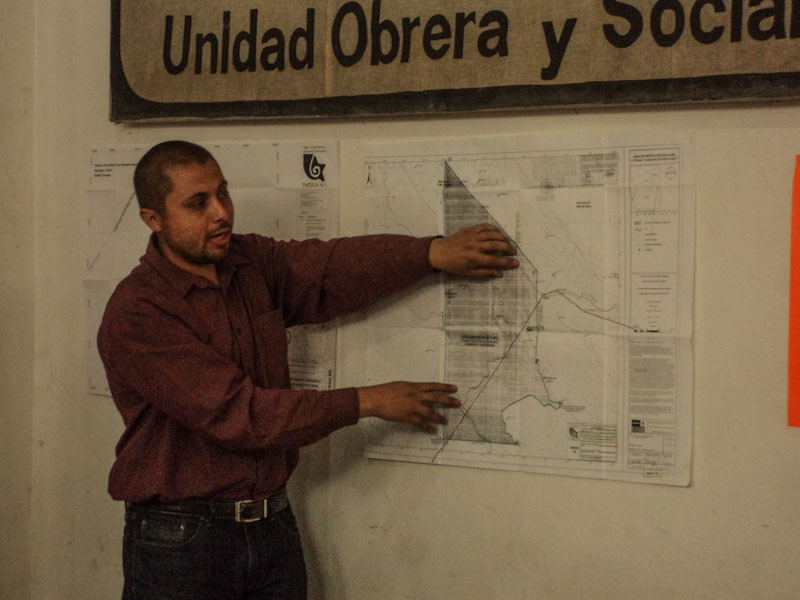 The judicial measure means that the authorities of Tila municipality, in the Northern Zone, cannot carry out any public works on the area that belongs to the ejido, which is also indigenous territory, until the litigation is definitively resolved. Last January 17th, Tila, which includes the urban centre of the municipal capital, filed a petition for amparo because the municipal authorities were seeking to promote the creation of a commercial centre on the site where the Casino del Pueblo is currently located. In the amparo mentioned above, the Chol ejido owners complain of the dispossession of the Casino del Pueblo and the intention of the authorities to erect a commercial centre there, since, the indigenous argue, “this illegal action violates ejidal social property and territorial rights, as well as the right of indigenous peoples to consultation and to the preservation of their institutions, forms of organization and cultural wealth” (see La Jornada, January 16 & 21). According to the Centro Pro, the government’s action “is part of a systematic dispossession against the Chol people.” Since 1966, different state and municipal authorities have attempted to dispossess the Tila ejido of part of its territory and they (the ejido owners) have obtained favorable resolutions in the lawsuits for amparos 590/77 and 259/1982. This last one is pending before the Supreme Court of Justice of the Nation, since authorities of the municipal council have refused to comply with the decision and restore an area of 130 hectares to the ejido owners. He had been in a coma for over a year, the first victim of the authoritarianism of Peña Nieto. Compañero de la Otra, de la Sexta, de siempre…!Kuy vive, la lucha sigue! This Wednesday marks five days since the (“temporary”, according to the displaced indigenous) return to the ejido Puebla, Chenalhó, but there are still no safe conditions for the final return. 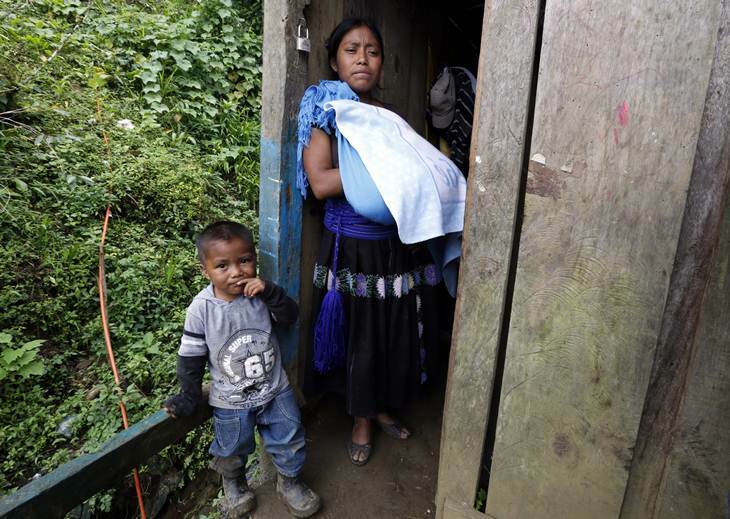 The displaced families abandoned the village six months ago, following assaults and false accusations from the PRI ejidal authorities. Last Friday [17th January], 14 of the 17 families currently taking refuge in Acteal went in a caravan to recover their land and harvest their coffee, preceded by state and federal officials who came to meet with the dominant group of the ejido, headed by evangelical pastor and commissioner Agustín Cruz Gómez. On this occasion the following attended, escorted by state police: the Government Secretary, Enrique Ramírez Aguilar, and the undersecretaries Mariano Díaz Ochoa (Regional Operations), Belisario Rodríguez (Indigenous Peoples and Culture) and Víctor Hugo Sánchez Zebadúa (Religious Affairs) as well as Francisco Yáñez, federal envoy, and the mayor of Chenalhó, José Arias Vázquez. They met amicably with the Commissioner Cruz Gómez and other ejido authorities responsible for the violence, displacement and dispossession. 16 officers of the Public Ministry (MP) came with them, along with two expert surveyors to visit the plots of the displaced, who have reported thefts and destruction. They were coordinated by Rigoberto Jiménez Carrillo, deputy director of Process Control from the Agency Specializing in Indian Affairs. A brigadista reports that, “indeed, there is damage to some houses and plots. In five of them, “the water has been cut off, and wood and coffee have been stolen from the plots of land.” The indigenous “have found horse tracks, and we listened to families who have lost their entire harvest, such as pumpkins, and alternative crops.” In addition, during the six months of forced displacement, they have not been able to weed the “farms” of the aromatic crop. The displaced are expected to conclude the work of collecting the coffee on the 27th.